It’s nice to have a chance to be in Dallas Modern Luxury for May 2012. This article was about what is in my traveling bag. 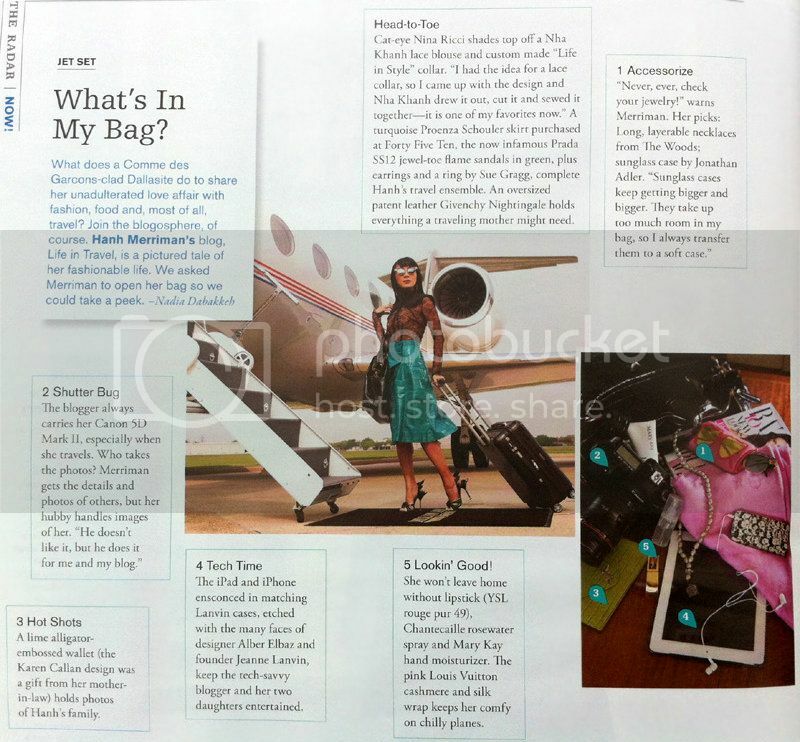 This page is usually called “In the City”, because of this month is a travel issue and it’s called “In the Bag”. Thank you Nadia Dabakkeh for the interview and Nick Prendergast for the photos! To take closer look at the shoot, please click here. Congrats!.. What about the carry-on you use? any brand/model in particular that you'll recommend? I've been thinking on investing on a real good one, but I don't know where to start looking, specially now that airline companies keep reducing the dimensions allowed in the plane! any suggestions? thanks! I'm using Rimowa 4 wheels roller for both check-in and carry-on luggage. It's light weight, you can pack more things in, and it's easy to roll. A big hello from Kuala Lumpur, Malaysia! It shows that a great deal of thought & planning has gone into it. I travel a fair bit myself…and I never check-in the jewelry. That is so cool. Great. You look great in that picture! Awesome picture. I like this handbag because its very simple and unique. Thanks for the post…. I have been exploring for a bit for any high quality articles or blog posts on this kind of area . Exploring in Yahoo I eventually stumbled upon this web site. Studying this info So i am glad to show that I have a very good uncanny feeling I found out exactly what I needed. I most definitely will make sure to don?t omit this site and provides it a glance on a constant basis. I have been browsing online greater than 3 hours today, but I never discovered any fascinating article like yours. It is pretty price sufficient for me. Personally, if all webmasters and bloggers made good content material as you did, the internet will be much more useful than ever before.